Veterans Day, November 11th, 2008, at USS Alabama Battleship Memorial Park, a tribute was unveiled to canines that have served as alert dogs in the military. 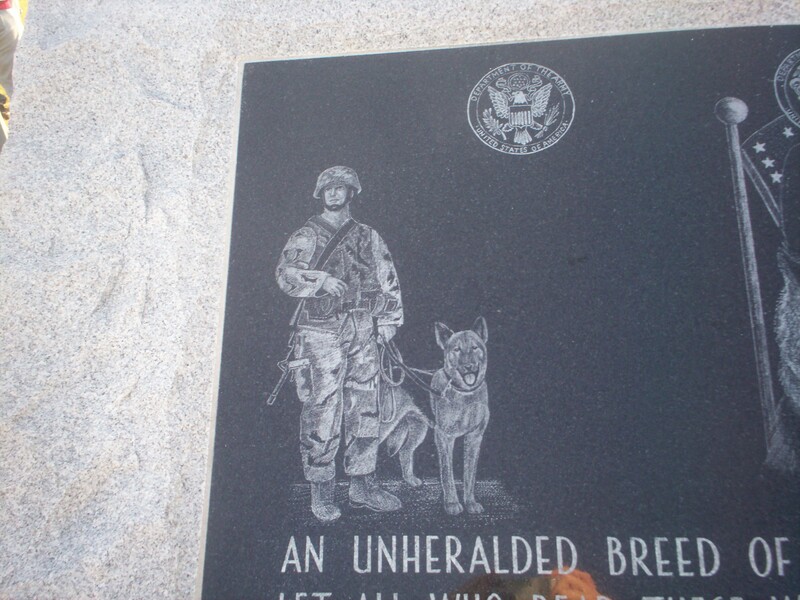 The four-ton granite slab supports statues depicting a war dog, his handler and other soldiers. 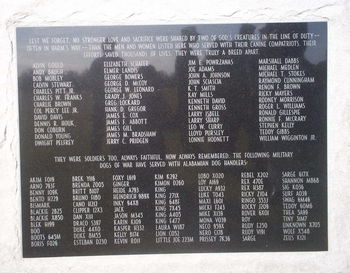 The marble back side contains a listing of war dogs associated with handlers from Alabama . In front of the piece are boot prints made from an actual soldier's footwear, along with paw prints. The idea, said John O'Malley, is that visitors can more easily identify with the men and the dogs that have faced great danger during battle. 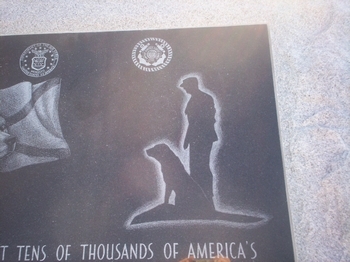 O'Malley, president of the Alabama War Dog Memorial Foundation, said the $58,000 memorial took six months to design. NATION IN TIMES OF WAR, ALL GOING INTO HARM'S WAY WITH DISTINCTION AND VALOR – UNHESITATING. LET US NOT FORGET THESE UNSUNG HEROES ARE SOLDIERS, TOO! THESE VALIANT DOGS PROTECT OUR MILITARY MEN AND WOMEN THROUGH COUNTLESS PERILS, GIVE COMFORT IN UNCERTAINITY, AND SHARE THE SUFFERING AND THE RISKS IN THE TIME OF WAR. OVER THE DECADES, MANY OF THESE DOGS HAVE MADE THE SUPREME SACRIFICE, GIVING THEIR OWN LIVES TO SHIELD OUR ARMED FORCES AND MILITARY ASSETS FROM HOSTILE ACTS. CANINES IN THE ARMED FORCES CONTINUE THAT NOBLE TRADITION AROUND THE WORLD TODAY. The AWDM dedication ceremony was a great success; it was a special day for Alabama dog handlers, their day, to receive recognition for their service to the country. The day was also to pay homage to the military working dogs (War Dogs) that served by their side and continue to serve with America 's armed forces around the world. We salute them, one and all. Clark Memorials installed the Monument on Sunday, November 9th, 2008. 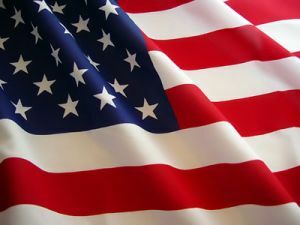 The dedication was held on Veterans Day, Tuesday, November 11th at 2:00 PM at the USS Alabama Battleship Memorial Park. Thirty board members and guests attended a special dedication luncheon on the USS Alabama Battleship, John O'Malley present a history of the AWDM and gave recognition to those who made a special impact on the project. Estimated 120-30 attended the outside dedication ceremony, standing room only. A dozen or so dog handler Veterans were present, plus many Veterans. In addition, the Pensacola Naval Air Station sent two military working dog teams to the dedication; MA2 Joshua Johnson, MA2 Danielle Kiogina & Rick, MA1 Richard Hornsby, MA2 Adam Taylor & Drummo. John O'Malley opened the ceremony and introduced Bill Tunnell, executive director of the USS Alabama Battleship Memorial Park to welcome everyone to the dedication and officially receive the monument. Wade Franks, Bill Wigginton, and Roy Burchfield, AWDM Board members and Vietnam dog handlers, spoke about their experiences as dog handlers and their dogs. Wade Frank spoke about Little Joe, a stirring and quite moving story; he brought the crowd to tears. Little Joe was the AWDM mascot and represents all war dogs past and present. Lead by Roy Burchfield, the war dog handlers in attendance were invited to advance and unveil the monument as a group. Roy Burchfield read aloud the front plaque dedication to the crowd. Bill Wigginton stepped forward to read the names of the seven Alabama war dog handlers killed in Vietnam . 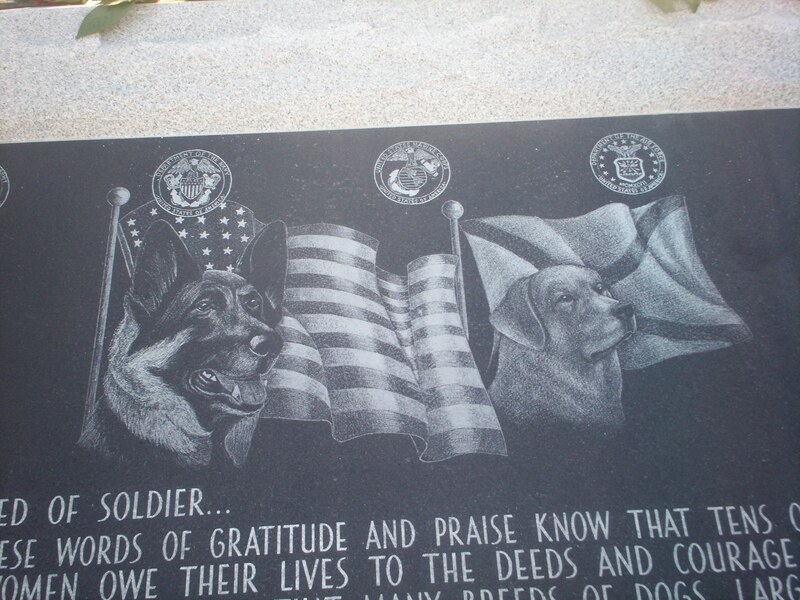 After a name was read, a rose was placed on the monument for each of the seven dog handlers that died in Vietnam ; the person laying a rose was either a family member or close friend, or a person with a strong tie to war dogs and their handlers. Next, Ron Gillespie, Vietnam Dog Handler, placed a flower bouquet was at the paw prints in front of the monument to honor all war dogs, past and present. A moment of silence followed to reflect on our unsung heroes. The Homeland vocal group closed the ceremony by singing our National anthem. To say the least, the monument was awesome, the ceremony was very moving, and there were few dry eyes in the crowd. The Dog Handlers and their K-9 soldiers had their day in the sun. It was a great day to show one's appreciation to our Veterans. 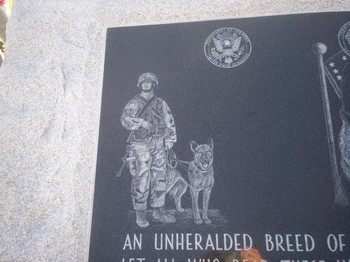 "There are many different kinds of war dog memorials," said O'Malley, who served in the Marines but had no connection to war dogs. "But I'm telling you this one is the best." O'Malley said specially trained dogs can alert troops to enemy soldiers and booby traps as far as a half-mile away. 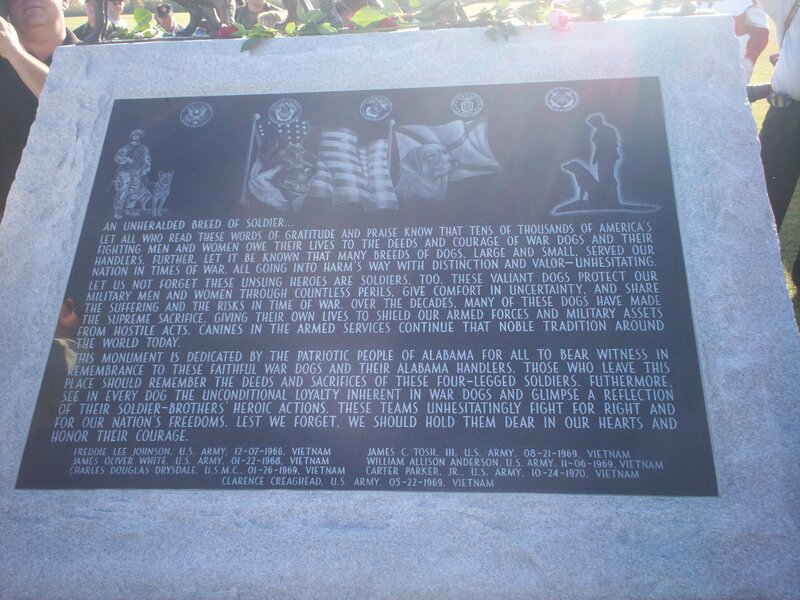 AWDM Board members are working diligently to raise the remaining funds to payoff the Alabama War Dogs Memorial erected at the U.S.S. Alabama Memorial Battleship Park in Mobile on Veterans Day 2008. The memorial depicts an actual Alabama war dog team in action - Little Joe, a German Shepherd and his Alabamian handler, Charles “Wade” Franks and other combat patrol riflemen. Little Joe-our mascot-gave his life saving those men on February 22, 1970 in Vietnam . 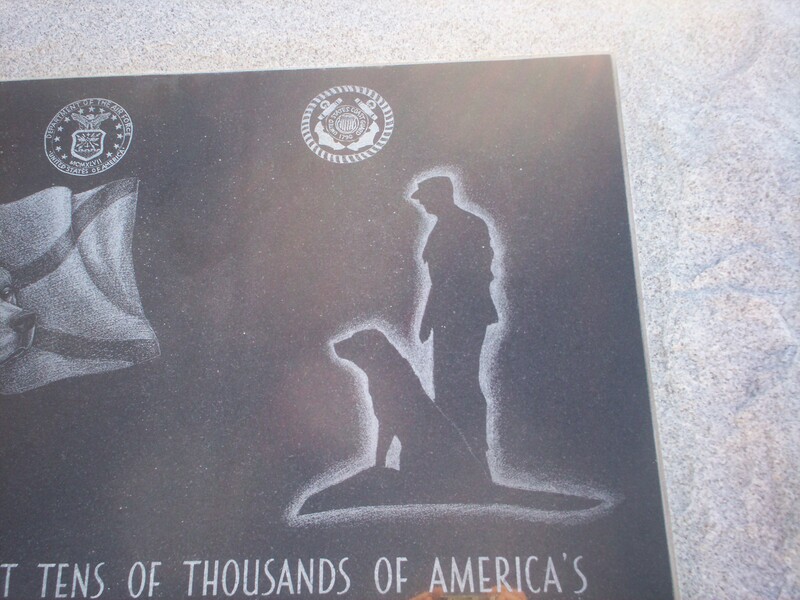 One of only a handful of memorials like it across the nation, the memorial honors the dogs and their handlers who have faithfully served and continue to protect the men and women in our nation's armed forces. Dog teams have served most prominently since the early 20 th century. For more information or to make a donation, please visit the memorial project on line at www.awdm.org or click on the donate button above.